As has been reported widespread in the media, last week, Casey's General Stores, Inc. (“Casey’s”), the owner of the convenience store chain Casey's General Store, filed a declaratory judgment action in Iowa federal district court against Doctor’s Associates, Inc. (“Subway”), the owner of the sandwich shop franchise Subway, seeking a declaration that the term “FOOTLONG” is generic when used in connection with a “footlong submarine sandwich” and thus Casey’s use of the term does not violate any trademark rights owned by Subway. See Casey's General Stores, Inc. v. Doctor's Associates Inc., Case No. 11-cv-00064 (S.D. Iowa February 11, 2011). DuetsBlog provides a good blog post on the lawsuit filing (including a link to the complaint here). Other news coverage here, here, and here. Other blog coverage from Lawyers and Settlements and Trademarks and Brands. As for how the FOOTLONG application for "sandwiches" ever got the past the examination phase to the publication phase, not even the prosecution history provides a clear answer on that. 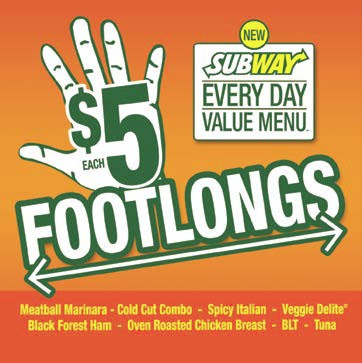 In response to a descriptiveness refusal by the PTO, Subway merely argued “When applying the mark FOOTLONG to sandwiches it would require imagination, thought or perception to reach a conclusion as to the nature of those goods or services.” Subway added some sales figures in its Office Action response in order to make a claim for acquired distinctiveness if needed – but it never became an issue because the PTO, after dealing with the refusal discussed below, simply moved the application along to the publication phase. Interestingly, it was not a descriptiveness refusal, but rather a likelihood of confusion refusal, that was Subway’s primary obstacle towards publication of its FOOTLONG application. In the PTO's office action, the Examining Attorney also cited the registered marks FOOTLONG EXPRESS (here and here) in support of a likelihood of confusion rejection. Subway was only able to get its application approved after winning by default cancellation actions against the marks FOOTLONG EXPRESS. See Doctor’s Associates, Inc. v. Skyline Chili, Inc., Cancellation No. 92050678 (T.T.A.B.). But even after the cited marks had been canceled, the Examining Attorney still received a 72 page Letter of Protest on July 24, 2009 (which would have only been forwarded to the Examining Attorney if the PTO felt that the information raised important issues for the Examining Attorney to consider). While there is a notation in the file that the evidence was reviewed, the application was still forwarded for publication (and the approval itself would have certainly undergone the usual supervisory review, so the approval cannot be blamed on a single Examining Attorney). The rest is history (in the making). One suspects that the PTO, recognzing its mistake to have approved for publication the "sandwiches" application, went above and beyond in order to support its refusal of the "restaurant services" application. Is there anybody out there that honestly believes that Subway is going to win this on any level?